Pokeshot///SMZ also took part in the conference with our partner Jive Software. We shared our thoughts and insights in a “fireside chat” about social learning management and in an expert panel that tackled the topic of measuring success of a social business initiative. And it was a very rewarding two days – in addition to our enriching experience as speakers and panelists, we gained fresh perspectives on social business practices and strategies, and had many interesting follow-up discussions after the sessions. The expert discussions at the Social Business Arena, on and beyond the conference stage, provided a good idea of what major developments will be forthcoming in this field in the near future. One of the main takeaways from the numerous talks was that greater emphasis must be placed on cultural change. Every company that is working toward becoming a “connected company” has to go through a process of cultural change. The technology used to make this transition is just a means to the end. Making life easier for your employees and your customers is a real possibility. All that a company needs to do is adopt the right mindset and the right company culture – its own unique culture. 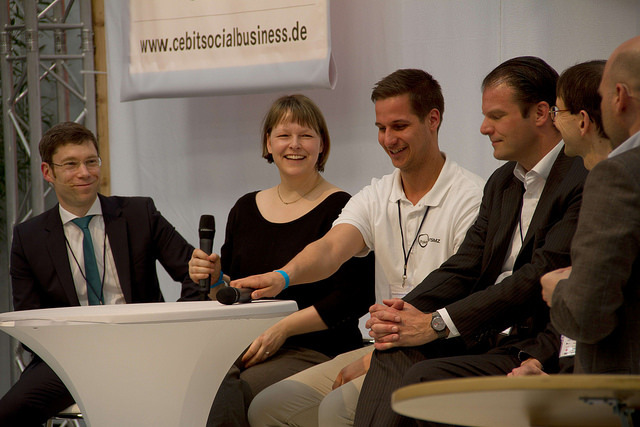 To learn more about the Social Business Arena @ CeBIT, from blog articles to program details to speaker and panelist information, go to www.cebitsocialbusiness.de or watch again the expert panel “Determining the value of social collaboration ROI”, where we attended .